MILLTOWN is one of the hidden gems of Ireland, and it too has its share of smaller gems, many of which are new even to the natives. Now there is no excuse for anyone in the village not to be an expert on their own place. The key to all this knowledge is the local guide to the area’s natural built and cultural heritage which has just been published. The handsome booklet with its upright format, will fit in a jacket pocket as on the shelf of the kitchen where everything of importance is kept. That was the message from the launch of the booklet on Sunday morning, when the best of the village’s food producers, craft workers and community organisations lined the hall in the community centre. They were there to showcase a remarkable community, known to all who travel the N17 north to Mayo for its unpretentious beauty, its excellent visitor facilities and its cleanliness. 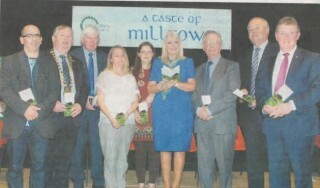 A proud local woman who now holds a position of national importance, Mary Mitchell O’Connor, Minister for Jobs, Enterprise and Innovation, cited Milltown’s remarkable record in the Tidy Towns Competition as evidence of the vibrance of the community. “I am a rural TD living in Dublin”, she told the audience, which included he proud parent’s paddy and Kathleen and brother Anthony. Heritage begins with a sense a being and belonging, which starts at home and is nurtured in school, said the minister, paying tribute to past and present teachers in the schools of the parish. She was glad to see so many children in the audience, getting the sense of what heritage is and how important it is. “I thought I knew Milltown until I read the book,” continued. So far she has read it three times, discovering something new each time, for example that Milltown was known as the Fairyhouse of the West on account of its race meetings and associated carnival. Community Council Chairman Michael Rhatigan had earlier urged everyone in the parish to have a copy – they sell at €5 – and to remember them as gifts for Milltown people living abroad. He was echoed by Minister of State Sean Canney, himself no stranger to Milltown from his years working as a quantity surveyor with the Rhatigan building firm. As part of his OPW brief, Minister Canney has had a number of heritage-related engagements, but the gathering at Milltown was the best turnout he had seen. It was important for places like this, and others in East Galway, away from the tourist havens of Galway city and Connemara, to market themselves to visitors who will appreciate what they find here. Community Archaeologist Dr Christy Cunniffe did a lot of research for the book, but said his greatest thrill was being allowed to coax a tune out of Pete Conlan’s melodeon. This relic of the renowned US based traditional musician was on display, but out of reach. Council Cathaoirleach Michael Connolly praised the great community spirit in Milltown, as exemplified by people like the late Frank Mullarkey, who donated land for community purposes. After the formalities there was time to inspect the stands around the hall and partake of the goodies on offer. The ideal way to end a book launch.